The SAAF Museum is done and dusted and a lot will probably be said and written not just about the show but also the complicated vendor, SAAF staff and media vetting system. Fact is the SAAF stuck with the system that caused mayhem last year. However, fortunately they also learned from their mistakes. It took me twenty minutes to get my accreditation compared to almost two hours last year and on Saturday morning the gate to the media and vendor parking was open when I arrived at 05.45. My accreditation was scanned and I was parked within minutes. Juri, who bought tickets on line walked straight in although the queue for those who still had to purchase tickets was long. Unlike last year when the field, because of delays at the gates, only started filling up by 10.00 on Saturday people were streaming in by 07.30. Getting out after the show was also not a problem with points-men on duty at all the major intersections in the vicinity of the base. The weather also played along. Welcomed by the spectators was the cloudy conditions that kept the heat away but the absence of the sun and grey skies played havoc with the photographers. However, by 14.00 the sun was out and it was a glorious autumn day. Superbly organised by the SAAF Museum, the show is the major source of revenue for the museum. There were no noticeable gaps between acts this year. 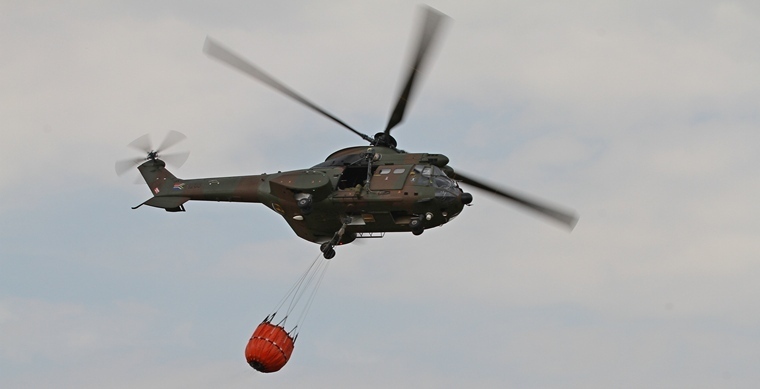 All the Museums current airworthy assets took part with some support from the SAAF. The balance of the performers was from the private sector. Except for AAD that is held every two years the SAAF Museum is currently the only airshow with substantial SAAF support. 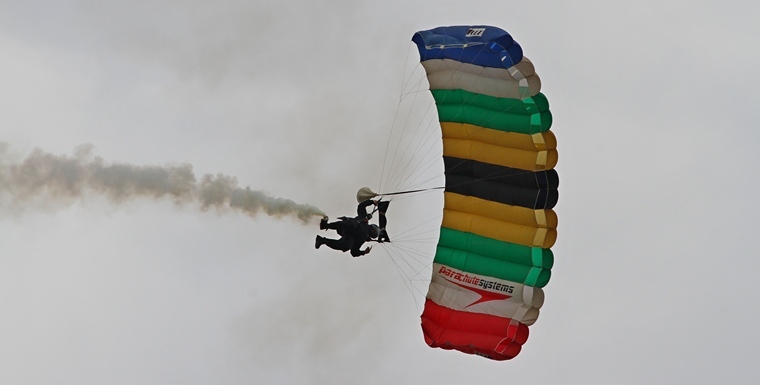 This year the SAAF displayed the Gripen, Hawk, Casa 212, Special Forces Skydivers as well as the Silver Falcons. The cockpit ambassadors of the SAAF, the Silver Falcons. There can be no doubt that of all the jets the Cheetah remains the crowd favourites. Compared to the Gripen with its amazing turning radius and Italian sports car style refinement and handling the Cheetah whose design is starting to show its age is none the less is the American Muscle car of aircraft. Its sheer presence that exudes menace and aggression steals the show every time. The Museum displayed the Kudu, Bosbok, Cessna 185, Patchen Explorer, Alouette IIs & IIIs, Harvards, Puma and de Havilland Vampire. Bosbok, Cessna, Kudu, Bosbok. The Bosbok and Kudu's were produced by Atlas Aircraft Corporation. The aerial ballet of the Allo II and III's. Patchen Explorer, the only example of its type in existence. De Havilland Vampire. There are currently two airworthy examples in the country. The other one is in private hands and based at Wonderboom. Privately owned aircraft and teams that participated was Nigel Hopkins in the Extra 330, Neville Ferreira in the Slick 540, Ivan and vd Schaar in the Stearman, the Puma Energy Flying Lions Harvard's, the Goodyear Pitts Special, Andrew Blackwood Murray in the Extra, Davis Laas's Impala, the Team Torre Pitts Special, Just Love Missions' Antonov AN2, the Powered Parachutes and Mango's Boeing 737. Puma Energy Flying Lion Harvards. The Museum show was the team's first public appearance in the colours of their new sponsors. Atlas Impala. Despite being produced in the hundreds this is the only flying example of this iconic SAAF trainer. Just Love Missions' Antonov AN2. The AN2 is the biggest biplane ever produced. 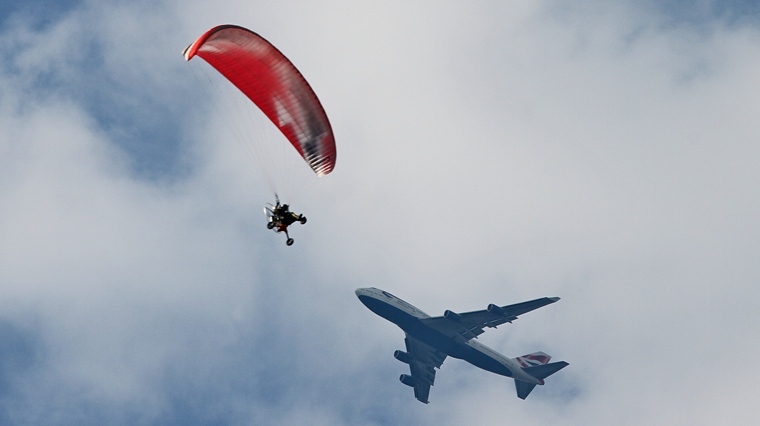 A Powered Parachute during their display with an Airbus A380 en-route to OR Tambo in the background. Highlights of the day definitely were the Cheetah, Nigel Hopkins in the Extra 330, Neville Ferreira in the Slick 540, the Allo IIs and IIIs aerial ballets. 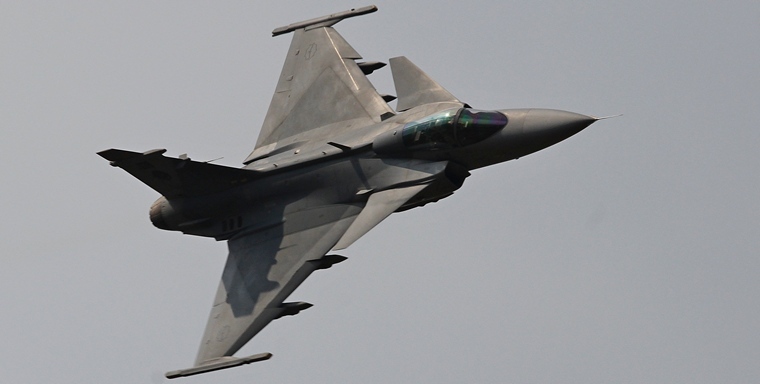 Disappointments of the day was the nonappearance of the Raptors RV team and the Gripen and Silver Falcons formation display that because of an apparent snag with the Gripen did not happen. A good broadcast system at any show is must, not only to keep the spectators informed and entertained but is also a legal requirement at major events. 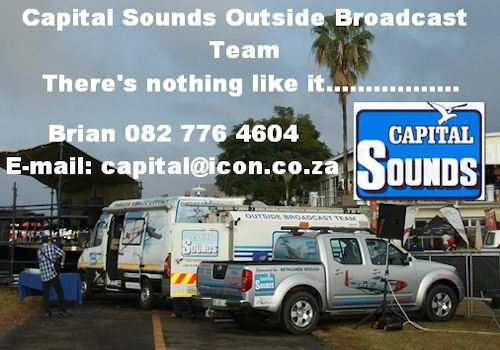 Capital sound, like last year was back with a full team of technicians. Commentary was led by Brian Emmenis, assisted by Leon du Plessis and Keith Fryer who handled the speciality acts superbly. Spectators leaving after the show. In our estimation between 35,000 and 40,000 passed through the gates. A number of facts have probably contributed in the fall in numbers from the original show a number of years ago when the Museum won the award for the best Airshow of the year and the next show when it was runner up and when an estimated 60,000 plus visited. The fact is that it will take years after last year's fiasco to convince prospective visitors that access to the show is easy and quick and user friendly. Furthermore the show program has essentially remained the same for the last five years whilst the state of the economy has seriously curtailed spending on non-essential items like entertainment. 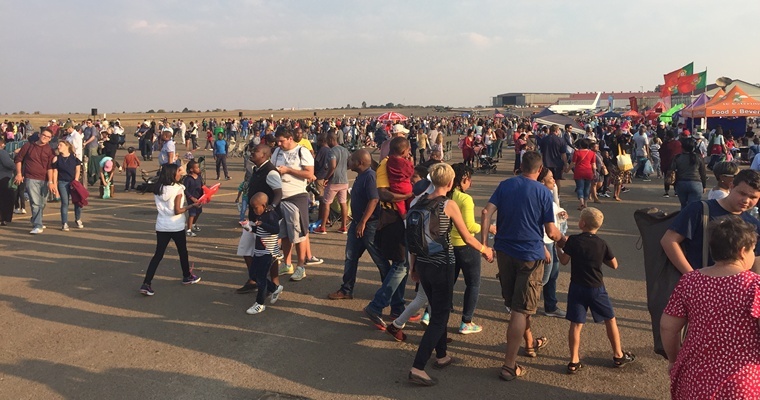 That said the SAAF Museum Airshow is still the most popular and supported aviation event, after AAD that is set to take place in 2018, on the aviation calendar. With tickets priced at only R80.00 per person (children under sixteen enter for free) the SAAF Museum Airshow is real value for money.